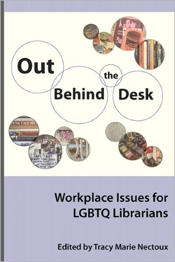 Neu bei Library Juice Press ist das Buch "Out Behind the Desk: Workplace Issues for LGBTQ Librarians", herausgegeben von Tracy Nectoux. Es bildet die erste Nummer der Reihe "Gender and Sexuality in Librarianship" und ist "an anthology of personal accounts by librarians and library workers relating experiences of being gay, lesbian, bisexual, transgendered, or queer at work. A broad spectrum of orientations and gender identities are represented, highlighting a range of experiences of being and/or coming out at work".